Product prices and availability are accurate as of 2019-04-02 15:50:47 EDT and are subject to change. Any price and availability information displayed on http://www.amazon.com/ at the time of purchase will apply to the purchase of this product. In a busy office, a plain- paper fax is an essential tool. The Sharp UX465 offers faxing with scan and copy features, too. 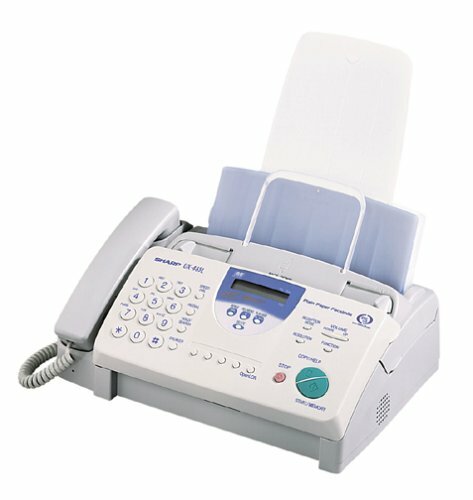 Fast six-second transmission with error-correction mode and extras like a 10-sheet automatic document feeder, auto dialing, ring distinction, speed dialing, and memory for 30 pages make the UX465 a complete fax solution. Program the UX465 with 40 speed -dial numbers for fast connecting and group faxing. Transmit your faxes at six seconds per page, with modem speeds from 14,400 to 2,400 Kbps with automatic fallback. An all-digital answering system is built in, with up to 24 minutes of recording time. Caller ID is supported when you subscribe with your local carrier. A useful copier function lets you send or copy up to 10 pages automatically. Ideal for small offices or crowded desktops, the compact UX465 measures just 14 by 13 by 12 inches.